Below is Marcie's Updates for 2012. 2010 and 2011 history & updates. Marcie’s health continued to improve, despite the skin issue which constantly plagued her. She insisted on pulling the tiny, incoming feathers out as soon as they emerged from the follicles, and so the skin became bruised and sore…and there was nothing I could do to prevent it. On the morning of Sept. 3, I noticed blood on Marcie’s beak. I suspected she had picked at her lower back again. (The picture shows the bare, affected area.) The surrounding feathers hide that feather tract, but underneath those feathers, inflamed feather follicles are visible. The tissue was again a dark black-red, a result of hemorrhaging just under the epidermis. She had aggravated it until it bled. I swabbed the area with the Domeboro to get a better look at the tissue, but could find no reason for the bleeding. 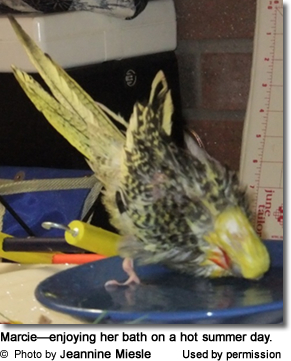 Whether the wound were due to a trapped feather or pruritus, she needed seeing to. By the time we arrived at Dr. Bob’s the next day, the Domeboro had done its job, and she had discontinued picking at it, so there was almost nothing to see. Dr. Bob peered intently through the otoscope, searching for the trapped feather that wasn't there. Three weeks later, we were back at his office. This time the tissue was far more discolored and inflamed; it had increased in size as well—to ½ inch in width. The incoming feathers were free and growing, not trapped—and she had lost some weight. “What’s going on with Marcie?” he asked. “That same area is really sore now, and it looks like it’s getting infected,” I replied. “Let’s see what we’ve got here,” he stated as he examined the tissue visually. He carefully lifted the skin with the needle of a syringe. Finding nothing, he concluded that Marcie had removed whatever was irritating her. He dripped an antibiotic wash into the epidermal area and administered a Doxy injection. I was to cleanse the lesion with Domeboro and apply the Gentamicin cream daily. By the next day, the inflammation had diminished; her appetite and energy level had picked up, and she had regained the three grams she’d lost. Once again, she dealt with the problem herself. A few weeks later, I noticed a tiny granule just under the skin. It appeared ready to burst from the tissue at the slightest provocation. I took the surgical blade and merely touched the skin, and sure enough, out it popped! At our next visit, Dr. Bob reported that it was simply a tiny fat and cholesterol granule—of no significance. Below: Marcie and Lucy playing in the kitchen cabinet. When Marcie first came to us, Lucy took her under her wing and became her guide and protector. She became Marcie’s guardian, watching over her as they played on the counter. Marcie learned much from Lucy—the pleasure of new foods, the fun of playing with toys, and how to defend herself. Lucy would shield her, too, chasing away any of “the boys” who wanted to usurp their play space. In her weakened condition, Marcie was powerless to look after herself. She had no idea how to go about it—she was that inexperienced in the ways of the avian world. Marcie was a quick study, though, and it didn’t take long for her to learn both defensive and assertive posturing from Lucy. Lucy was her constant companion. Marcie and Lucy quickly became devoted to each other. Although she could fly, Lucy had severely crippled feet, and she was unable to move quickly if another bird became aggressive. Once Marcie’s health improved a bit, the tables turned. Even in her weakened condition, she would face down the insistent male and shield Lucy from the threat, just as Lucy had done for her when she arrived. I was so proud of her—such a loyal friend! She was returning the kindnesses Lucy had shown her when she’d first arrived. Although she flew beautifully, Lucy never walked very much due to her disability, so she would remain in one place most of the time. She and Marcie had such a good time together. They played in the cupboard together, as the picture shows. Occasionally, Marcie would toddle over to her, chirp a barely audible “Hello” and return to her activities. She’d peek around the center of the cabinet at us, eliciting quiet chirps, making sure we were there. This was just adorable to watch. Marcie’s best friend, Lucy, passed away in May of 2012 from cancer, almost two years after we had taken them in. Marcie missed her, but she is resilient; she’s always been very independent. I’m sure was a consequence of her years of loneliness. She didn’t grieve for long, but we grieved, both for Lucy and for Marcie. Marcie is delightful. Very affectionate, intelligent, and easily bored! The better she feels, the more she learns from the flock about tolerance; she is not nearly as aggressive as she had been. She had no need to be, now that she was safe. Of course, we’re there to protect her—a gift she had never known before. She loves life now and fills each day with the normal cockatiel activities. We celebrate the day we adopted her. For us, June 30 is her birthday—it is the day she received a new-found life. The hearth by the fireplace is yet another play space for all of them. They’ve developed a taste for brick and mortar, however, so we’ve placed barriers against the wall to prevent them from picking at it. The warm, rainy spring likewise brought with it the breeding season; the hormones raged, and we were back to contending with the resurgence of reproductive behavior—constant contact calls, strikingly beautiful songs from him, and sexual posturing from her. Once again, Ernie was sent to his room—upstairs. Lights down, radio on, doors closed. They needed a break from each other and the contact calls. Even those efforts, at times, were to no avail—they could still hear each other, and the calls became even more shrill to conpensate for the distance between them! If the weather were nice, I’d take one or the other outside for a while. I’d no sooner come in and they would pick up where they left off. I had no choice but to get them hormone injections on a regular basis, as often as every two months. Sometimes the Lupron works well, but other times it doesn’t. If Ernie would stop calling her, she wouldn’t become sexually stimulated. The concern, of course, is that she could try to lay an egg and become ill or even die in the attempt. There are so many complications associated with egg-laying—she simply cannot endure such physical distress. Marcie is too fragile for a salpingo-hysterectomy (removal of the oviduct), so our only recourse is to keep the stimulation to a minimum by using the hormone injections. Marcie’s curiosity gets her into trouble at times. She still falls quite easily, and it’s always a worry that she has sustained an injury. Even though I administer Celebrex to help with the discomfort, the fall always results in a set-back—inappetence and weight loss. She’s so delicate...even small discomforts, such as nail-clipping, adversely affect her and impede her progress. I expect she will always be hypersensitive. Falls occur even in her cage due to her inability to balance and grip well. She becomes unsteady, seemingly oblivious to her surroundings or her position on a perch or any other surface. Eventually, I lowered her perches and platforms so that she would be closer to the towel-covered cage floor. As an additional safety measure, I added a second perch to connect the platforms. Hopefully, there’s no room now for her to fall. 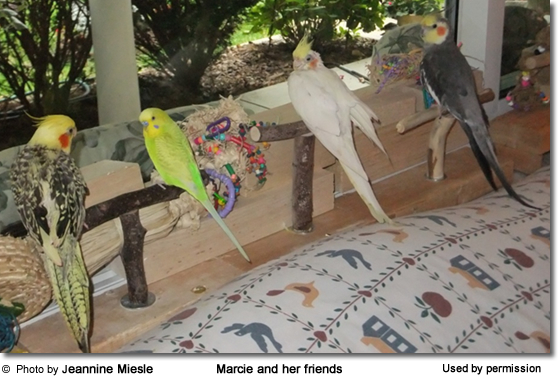 Photo below: Marcie, Peanut the parakeet, Bonnie, and Ernie—much cooler in the house than outside! Balsa wood provides both chewing activity and platforms on which they can climb and play. In October of last year, Marcie was able to return to me some of the comfort she received when she was so sick. After some unproductive arthroscopic knee surgery, I was in tremendous pain, and spent most of the time in bed with an ice pack. 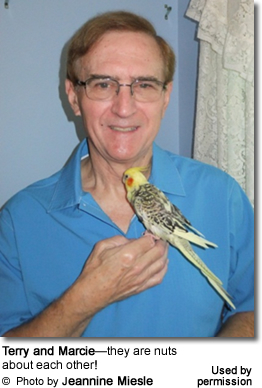 Terry would bring the birds up to me for a while, one or two at a time. Marcie would perch above me on the pillow or on my head. Just having her there with me was so comforting. I’d drift in and out, but I was always aware of where she was and what she was doing. Several times I was in so much pain that tears ran down my cheeks. Marcie would come down onto my face and lick the tears from my eyes! Of course, this tender act would bring about more tears…How dear and precious are the memories of those moments. When I finally underwent total knee replacement in February of 2012, Marcie was once again right there with me. This time, though, I improved quickly, and Marcie and I spent wonderful one-on-one time together as I healed. Marcie is not the most patient bird. When she is ready to move on to a different activity, it is now--not later. If she is not in the mood to be handled or relocated, she will inform me in no uncertain terms that she is not to be disturbed. She never really bites, but she can get very beaky and vocal…I quickly get the message! This little cockatiel is a problem-solver. One of the kitchen counters has been converted into a long play area, and Marcie claimed this as her own. We placed seed containers at the edge to protect her from a fall, but she would sometimes maneuver a toy or food bar over to the jars and climb up on them! She only accomplished this a few times before we realized that the empty containers were too light; she could push them off the edge or climb up on them effortlessly. This of course would inevitably result in a fall. Fortunately, we could hear them bounce, so we would dash to the counter—just in time! Then there was her best trick: She learned that if she stretched way up on her tip-toes, she could grasp the rim of the cap and pull the container over on herself. So we weighed the canisters down with wood. No more diving off the edge—or so we thought! It was balsa wood, not the best choice for foiling her adventures! After a week or so of watching her knock over the balsa wood before she pushed over the canisters, Terry built an 8” high screened barrier in three pieces that spans the entire length of the counter. So much for that little girl’s exploits! 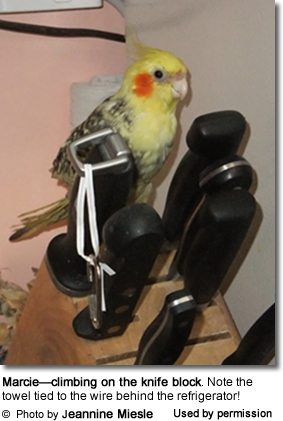 Once Marcie discovered the knife block on her counter, she went exploring. She would work a toy or bird bar over to it and climb up to the back of the block. Curious about what lay behind it, she’d peer over the edge to the back of the refrigerator. The thick, black wire was just too much of a temptation, so she scaled it, but then… stuck. We’d bring her down, and she’d begin her ascent once more. She had a fun time! Even though the chances of her squeezing behind the fridge and falling were slim, we’ve learned not to put anything past her, so we packed several towels into that space, as you can see in the picture. Undeterred, she scrambled up the towels, and again…stuck! So we piled toys on the block. Problem solved. Not really—she not only dragged the toys off the block, she loosened the towels and pulled them away from the wall! Terry finally hit upon a solution: He used electrical ties to affix the towels to the wire, thus securing them into the tiny space between the counter and refrigerator. Poor Marcie—now she had to find some new trouble to get into! Since then she’s been content to toddle up the long balsa wood steps we arranged by the knife block and shred wood. Marcie can be quite creative when it comes to entertaining herself. She’ll climb up a wicker pie plate toy and pull herself over onto the night light on her counter, perch there a while and wait for us to rescue her—she hasn’t solved the problem of how to descend from there yet. Her nickname is Hillary— as in Sir Edmond—climbing is her favorite pastime. 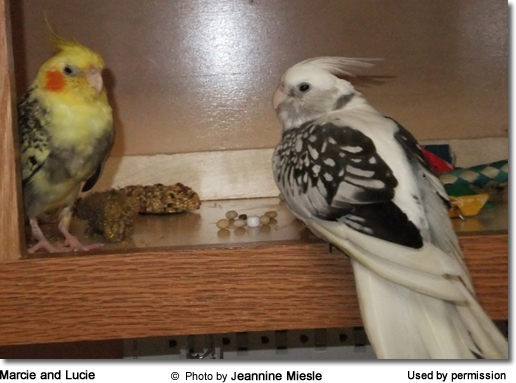 All seven cockatiels, in the summer of 2012, before Tina and Rico joined them. Early in November, Dr. Bob was able to procure a newly released medication, the Deslorelin implant, which is used primarily for birds exhibiting excessive hormonal behavior. It is particularly effective for females who are continual egg-layers. But instead of having Dr. Bob place the implant into Marcie, I requested that he insert it into Ernie instead, hoping to calm his hormones down, thus decreasing Marcie’s reproductive behavior. With Marcie’s skin being as sensitive as it is, and because she is so hyperesthetic, reacting so strongly to any sensory input, I realized she could not have withstood this procedure. 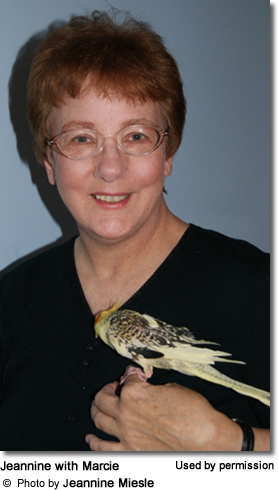 The implant is injected into the upper back with the bird under general anesthetic—another procedure she could not have tolerated. It’s designed to last much longer than the Lupron injections. If it doesn’t, it’s back to the injections again. I am beginning to suspect a link between the feather destruction and the reproductive behavior. The sexual frustration she is experiencing may be manifesting itself in the form of feather destruction. The last few months saw continued improvement for Marcie. However, there was one difficulty that never seemed to end—her falls. No matter how careful we were, Marcie would lose her balance and fall. The worst of these took place early in November, when I carelessly assumed she could perch on a swing over my head and I would be quick enough to catch her should she lose her balance. Well, I didn’t catch her, and she plummeted to the floor. I rushed her to Dr. Bob. There were no broken bones or internal injuries, but she was in shock and unable to walk or balance as before. He gave her a Doxy injection and told me to administer Celebrex and provide her with supportive care. Her grip and balance were poor, so she was once again in the “infirmary.” She needed constant supervision, so she was restricted to the barricaded counter or a low play area with us close by. She simply was not steady enough to be in her house. I was guilt-ridden and vowed never again to allow her to be anywhere high enough to result in such a terrible fall. We provided her with rest, more frequent doses of the Emeraid formula, and Celebrex for discomfort. After two weeks, her appetite and balance began to improve. By the end of November, she had regained most of her weight, but she still had difficulty balancing and walking, teetered back and forth on her feet, trying to regain her equilibrium. She would tip over backwards or sideways at the slightest misstep. Her wings would not extend as before, and her tail could not prevent her from rolling over. Dr. Bob felt it would take at least three weeks for her to fully recover, but it’s taken a full eight weeks for her steadiness to return and for her to return to normal. How could I have been so foolish as to think she has more stability than she does? Denial. I hung a small orbiter in her play area, and she uses it, but nothing will ever be the same as those lofty places birds love. In early November, we adopted two cockatiels that had belonged to a man fighting cancer. Re-homing them took a great deal of compassion and courage on his part; he cared enough for them to offer them a better life. The female, Tina, had been picking at her upper wings until they bled. At her checkup, the Gram’s stains tested positive for fungal cells. After a few weeks on the Emeraid formula, Nyzoral for the fungal spores, Optomega for the skin reconditioning, and daily applications of Aloe Vera for her skin, she began to grow in healthy new feathers. Rico had no serious issues in the beginning, but was vitamin deficient. His nutrition had been lacking, so I started him on the Emeraid as well. After a couple of weeks, he became ill and tested positive for Staphylococcus bacteria. He will be on medication for that long-term. When I saw how well the Optomega was working for Tina, I began to suspect that Marcie didn’t have fungal issues as much as dry, itching skin. Dr. Bob had tested her numerous times but had usually found no reason for her to damage her tissues. I concluded that the picking was either psychological or a result of dry or pruritic skin. It could even be habit. I eliminated the psychological possibility, since she has many toys and opportunities for enrichment, and she receives an abundance of socialization and affection. So it must be partly due to dry skin and partly due to habit. I administered the Optomega for a few days, but her appetite decreased; I will wait until she’s well over the trauma of her fall to reintroduce it. 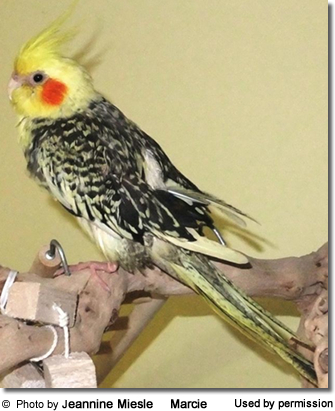 Rico and Tina are friendly, gentle birds—very bright and curious—and they quickly adapted to their new home. Before long, they found their places within the flock. Tina fell for Terry instantly (he’s such a chick magnet!). Rico, the new male, is also very dear, finding his place on my shoulder most of the time. He is quite pleasant to everyone. Marcie was quick to befriend Tina, and the three girls spend pleasant time together on the play counter. Rico loves to be on the counter, too—especially when Tina is there with him. Occasionally someone will comment that we have made great sacrifices to take in and care for these precious birds. I never cease to be taken aback by that. A “sacrifice” implies that there is something else we’d rather do with our time, money or energy. There’s no other place I’d rather be, nothing else I’d rather spend my money on, and nothing I’d rather do than care for these birds. It’s certainly not a sacrifice. Travelling, shopping, dining out—these hold no interest for us. Only caring for the living creatures in our charge. After all, when all is said and done, only the good we do for those less fortunate—animal or human—truly counts. The moments with our flock are idyllic, but my most precious interludes will always be with my sweet Marcie. Time is transient; the moments we have with her—with all of them—gone in the blink of an eye. What might seem inconsequential to some is treasured by us. Reflecting on the last few years with her and the rest of the birds we’ve taken in gives me pause to once again ponder life’s meaning. I had nearly given up the pursuit. And even after years of watching over them, it still didn’t become clear until Marcie entered my life…I chanced upon myself through her.